As an economic bloc, ASEAN is the fifth largest economy in the world. However, this is not reflected in the adoption of digital transformation. ASEAN member countries rank from top to 160 positions on the global Digital Adoption Index (DAI) published by the World Bank. Singapore sits atop the ranking followed by Malaysia in a distant 41st place; Thailand (61); Brunei (58); Vietnam (91); Philippines (101); Indonesia (109); Cambodia (123); Lao PDR (159) and Myanmar (160). Internet connectivity is the basic requirement for participating in the digital economy. On the consumer side, Internet connectivity via fixed line and mobile data are sufficient. However, for businesses, fixed broadband Internet is essential as mobile internet is both, too slow and expensive. In this regard, Internet penetration is lower. The International Monetary Fund (IMF) has said that Internet penetration is high in countries such as Brunei, Malaysia and Singapore. However, in less developed countries such as Cambodia, Indonesia, Lao PDR and Myanmar, approximately 70 percent of the population there have no access to the Internet at all. 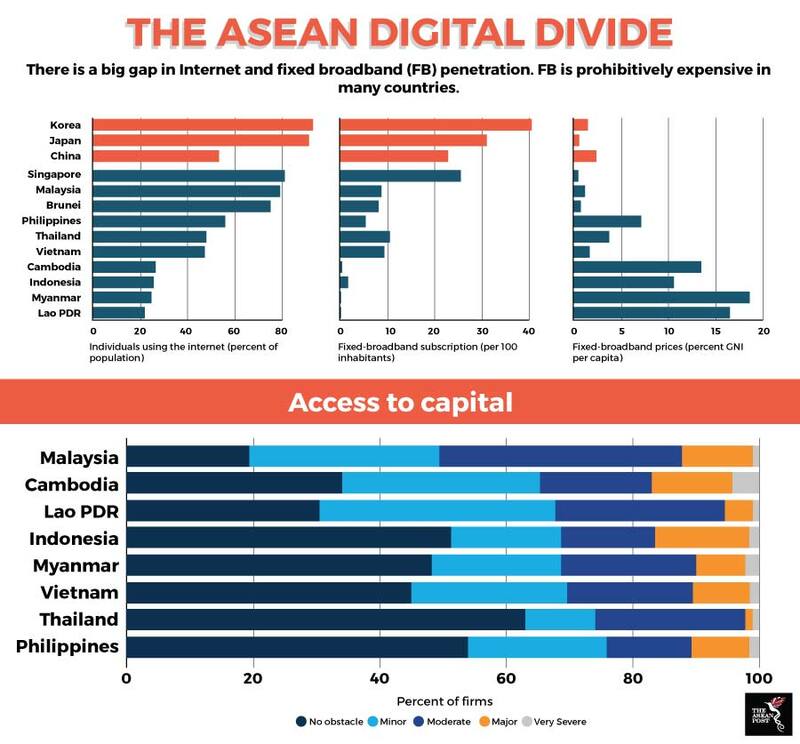 The adoption of high-speed Internet using fixed broadband in ASEAN member states is hampered by high costs. Among the six largest economies in ASEAN (ASEAN 6), Singapore has the lowest high-speed Internet cost at US$0.05 per megabit (Mbit) per month, followed by Thailand (US$0.42); Indonesia (US$1.39); Vietnam (US$2.41); Philippines (US$2.69) and Malaysia (US$3.16). Fixed-line broadband not only leads to faster mobile Internet speeds but also lets businesses better cope with video streaming, manage their supply chains on cloud computing and for governments to coordinate their agencies in real time. “Without ultrafast broadband, innovations such as artificial intelligence (AI), the Internet of Things (IoT) and Industry 4.0 will not be feasible,” said Richard Record, lead economist, World Bank Group, recently at a forum in Penang, Malaysia. The high cost of fixed-line broadband has resulted in lower adoption rates especially among small-to-medium enterprises (SMEs). Larger companies typically adopt digital technologies more readily to engage in e-commerce. This goes against the presumption that the Internet provides a level-playing field that enables newer, smaller, entrepreneurial companies to enter the marketplace and thrive. There is a risk of a widening digital divide within each country where large companies dominate smaller companies that lack the resources for digital transformation. This can undermine a country’s plans to turn its digital economy into an engine of growth.